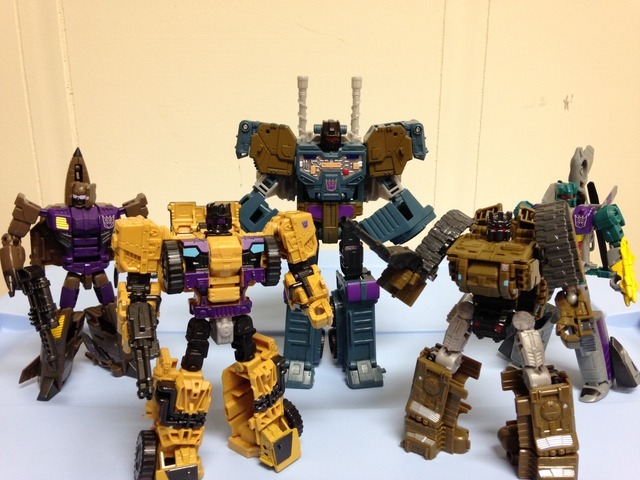 Bruticus is composed of five Combaticons (technically this version can also include Legends class Shockwave making it six) Onslaught, Blast Off, Brawl, Swindle, and Vortex. I’ve covered the various ins-and-outs of the alternate and robot modes of these individual figures in their own reviews, so I won’t dabble with that here. Just realize that all of these figures are pretty solid on their own, and as a set, they really shine. Aesthetically, Bruticus hits all the marks. The set is a faithful representation of the G1 toy with all of the modern updates you should expect. Molded detail is great all around, and the parts that make up Bruticus’s chest plate, head, hands, and feet are well done. The colors are pretty well set from the individual bots, and that’s OK with me. The snap-on chest plate that is part of Onslaught is a nice touch; at least it isn’t some separate piece that falls off easily (i.e. Blackjack on Menasor). The plate tabs in well to the shoulders and is functional as well: it keeps the arms in their sockets. The head design is great as well, and is a great rendition of the original toy and he's proportioned fairly well. 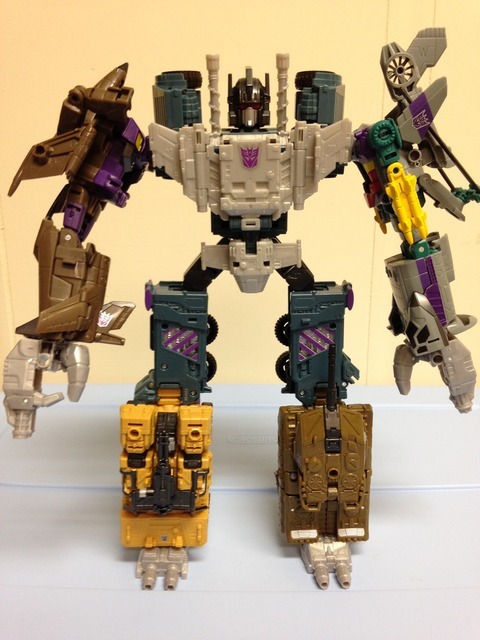 Functionally, Bruticus works… OK. There are several spots to bend his joints: elbows, shoulders, hips, knees, neck. All of which work pretty well, and hinderance isn’t an issue. There are two variations on the thighs that you can take with him too; one with Onslaught's thighs out, which add mobility but reduces stability, and the other with his thighs tucked in giving greater stability at the sacrifice of hip mobility. Either way works, and it gives you options for what you want to accomplish. Balance can be an issue, however, as the feet design on these combiners doesn’t allow them to pivot or bevel. If you move the legs too far out, Bruticus falls on flat, slippery surfaces. Positioning is much better on carpet, as there is some friction to help. I feel that Onslaught’s poor hip design can be an issue as well when they are extended; the legs can be bothersome to get positioned properly. This can be exacerbated by moving the arms out; the heaviness of the arms (they are deluxe figures after all) leads to instability that the feet cannot compensate for. Despite these foibles, with a little care, you can get Bruticus into a variety of positions for play. 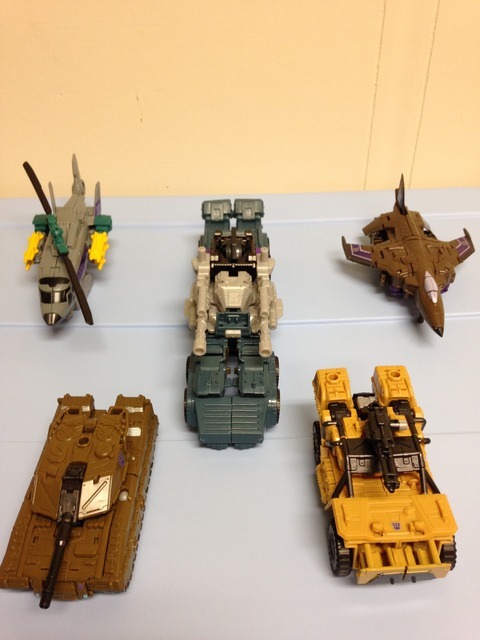 I think Bruticus is a great set to have. He’s a classic Combiner, and the work Hasbro did on this one was fantastic. 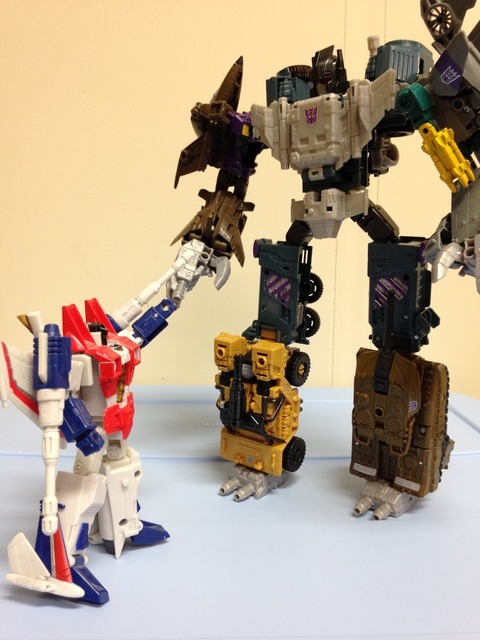 The limbs can be swapped Scramble City-style into any leg or arm, or even swapped between Combiners. The fun that can be had with him is pretty endless, and if you couple him with other Combiner parts or figures you can be busy for hours. Transformation Design: 5 Getting everyone in their arm and/or leg modes is easy and simple. The ability to swap limb for limb anywhere is a fantastic feature. Durability: 8 Outside of a couple thin pieces here and there, the whole set is robust. 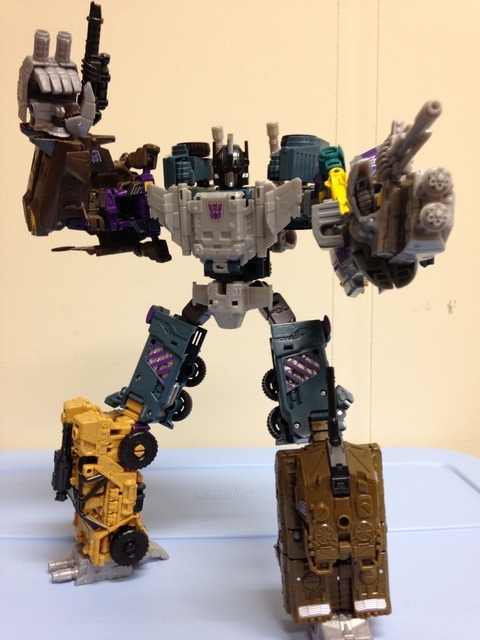 Fun: 9 Bruticus is great. He has great size, some neat weapons, and if you can couple him with Shockwave, you can have good fun. The only downside is balance. Aesthetics: 8 Bruticus looks great all around. I’m sure there’s a group that dislike the hands and feet, but I’m happy with him. Articulation: 7 Bruticus isn’t hindered, but moving the limbs around really throws the balance out of whack. It can be a challenge to get him into action positions, but for a Combiner, you really can move around a lot of parts. Value/Price: 10 Let’s be clear: I got all the separate pieces on discount for a running total of $55 USD. That’s a great deal. I don’t think I would be as pleased had I shelled out $85+ at normal retail. Overall: 9 I think Bruticus works exceptionally well as a set. It’s a great representation of the G1 toy, and he’s a classic Combiner. He looks good, has a lot of fun features, and if you can piece him together on the cheap, I would heartily recommend it.